Would you ever think to eat a fern? I eat anything that won’t make me sick, so I sure have, but young fern shoots are not the first thing that comes to mind for most people when they think of spring. Oddly, they are the first thing that comes to my mind when someone says “spring.” Early spring is fiddlehead season, and these crunchy vegetables are one thing I look forward to when winter is ending. Fiddleheads are the young shoots of the ostrich fern, and I am surprised that they are not more popular than they are, the stem is crunchy, and the leafy spiral in the middle is soft and sweet. Plus, fiddleheads are cute, but not too cute to eat (like baby bunnies). 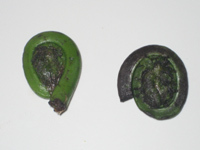 Fiddleheads do not have a long shelf life. I generally cook them the day I buy them, or perhaps the next day. It is not that they go bad, but that they tend to oxidize quickly, which will make them look less appealing. You may want to cut off the dark, oxidized skin on the fiddleheads to prepare them for cooking, which is very easy as it is just the skin that oxidizes and turns brown. It is not required, though, as the oxidized skin will not contribute any off flavors to the fiddleheads. One thing to keep in mind is that fiddleheads should not be eaten raw, they contain compounds that are both unpleasant, and could potentially make a person ill. But cooking them makes them entirely safe to eat, and tenderizes the shoot as well. Fiddleheads are also surprisingly high in anti-oxidants, much more so than even blueberries, as well as omega-3 fatty acids, making them both healthful and tasty. Fiddleheads are very high in fiber and vitamin A, and low in everything that you don’t want. They are an excellent spring treat, particularly for those who are watching what they eat (e.g. no fat, no cholesterol, almost no carbs, and very low in calories, only 35 per 1/2 cup serving). Many recipes call for boiling or steaming them, which works well and doesn’t add any fat or calories from oil, however I prefer to saute them with a little oil and garlic. That said, I have been known to steam my fiddleheads prior to a quick saute in order to speed the process and this can also reduce the potential for bitterness that may be found in them. They also go well in pasta and stir fry, but nothing beats a good old saute to bring out their own natural flavor. Fern shoots may not be an obvious star of a dish, but you would be surprised at their delicate and interesting flavor. Even my children find fiddleheads a fun and interesting diversion to the usual vegetable argument. N.B. a few drops of lemon juice can bring out the flavor and help prevent darkening (oxidation) of the fern shoots. 1. 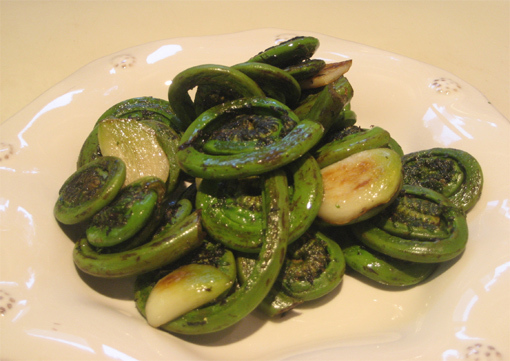 Cut off any black ends of the fiddleheads, and slice off any black/brown skin from the stems. 2. Wash the fiddleheads and pat dry. 4. 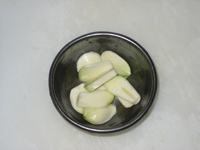 Put the garlic in the oil and turn heat to medium high. 5. When the garlic starts to sizzle, add the fiddleheads. Turn the heat down to medium and saute fiddleheads until soft, about 10 minutes, then serve. Salt to taste. Serves 1, but this recipe easily scales to as many servings as you need.